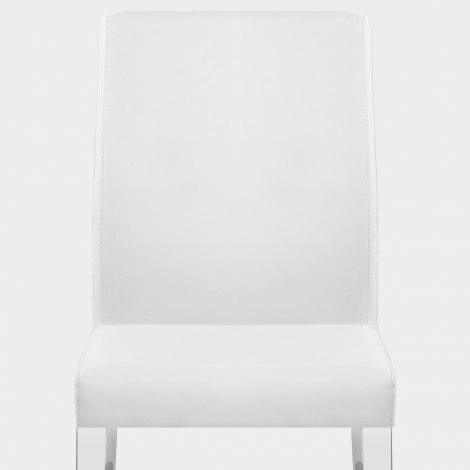 Simple elegance makes the Dash Dining Chair White an endlessly versatile dining chair design that has the ability to be featured within rooms of varying decorative styles. Smart and sleek, the Dash delivers modern minimalism and classic comfort. Padded and upholstered in white faux leather, it successfully merges minimalist style with comfort to create an unmissable product. The high backrest gives support whilst remaining simplistic in its design, suiting minimalist or traditional decor. Four mirrored chrome legs provide eye-catching features, as they stylishly taper to the floor and have a distinctive, rectangular shape. Each featuring protective pads for use on your floor, they finalise the Dash’s outstanding design. "The nicest chairs I have seen"
Bought 6 of these chairs in white, really pleased with the product, they are beautifully white,and look great with our glass dining table, the ordering was straightforward and the delivery was superb, really pleased with the end result. I wasn’t disappointed with these white dash chairs. They look really good with glass dining table and are quite comfortable. Only small criticism is that they were quite noisy when moving on laminate flooring but this was easily rectified with good quality pads. Have been looking for dining room chairs to match my Orion glass dining room table. Really pleased with these chairs. Comfortable elegant and great price. Really impressed with Atlantic team customer service both online through email and by phone. Polite, well informed and really helpful staff. Our first big internet buy and a pleasure to deal with this company. Speedy low priced delivery and no problems returning 1 grey dash chair which didn't match my other furniture. Thank you to all especially Anna for all their help and advice. These are the best quality and look more expensive than they are. The nicest chairs I have seen. They enhance my glass table and the chrome legs of the chair match the chrome legs of the table. I am so pleased with the purchase as was rather apprehensive buying them online and not physically seeing them..